The shell rows and stripe rows of this blanket have a very gentle ripple. This blanket can be made in a solid color or in as many colors as you wish. The example is made in worsted weight acrylic yarn. The dc5tog used in the first row of this pattern uses 5 chain stitches. On sequent rows, it is going to be formed over a stitch and two adjacent chain spaces. The stitch before the dc5tog will be a dc in a ch sp. The first two yarn over and inserting hook will be in this same ch sp. The third will be in the sc or dc that is next. The fourth and fifth will be in the next ch sp. The beginning chain should be a multiple of 48 plus 9. Row 1: Dc in 4th ch from hook, dc in next ch, 3 dc in next ch, dc in each of next 21 ch, dc5tog (uses next 5 ch), dc in each of next 21 ch, ** 5 dc in next ch, dc in each of next 21 ch, dc5tog (uses next 5 ch), dc in each of next 21 ch. Repeat from ** across to last 4 ch. 3 dc in next ch, dc in each of last 3 ch. Row 2: Ch 1, turn. Sc in first dc, sc in each of next 3 dc, ** ch 3, skip 1 dc, dc in next dc, (ch 3, skip 3 dc, sc in next dc, ch 3, skip 3 dc, dc in next dc) twice, ch 3, skip 5 dc, sc in dc5tog, ch 3, skip 5 dc, dc in next dc, (ch 3, skip 3 dc, sc in next dc, ch 3, skip 3 dc, dc in next dc) twice, ch 3, skip 1 dc, sc in next dc. Repeat from ** across to last 2 dc and turning ch. Sc in each of next 2 dc. Sc in top of turning ch. Row 3: Ch 3, turn. Dc in second sc, dc in next sc, 4 dc in next sc, skip ch-3, sc in next dc, skip ch-3, ** 7 dc in next sc, skip ch-3, sc in next dc, skip ch-3. Repeat from ** across to last 4 sc. 4 dc in next sc. Dc in each of last 3 sc. Row 4: Ch 1, turn. Sc in first dc, sc in each of next 3 dc, ** ch 3, skip 3 dc, dc in next sc, ch 3, skip 3 dc, sc in next dc. Repeat from ** across to last 2 dc and turning ch. Sc in each of next 2 dc. Sc in top of turning ch. Row 5: Ch 3, turn. Dc in second sc, dc in next sc, 3 dc in next sc, (3 dc in ch-3 sp, dc in dc, 3 dc in ch-3 sp, dc in sc) twice, 3 dc in ch-3 sp, dc in dc, dc in ch-3 sp, dc5tog (uses 2 in ch-3 sp, 1 in sc, 2 in next ch-3 sp), dc in ch-3 sp, dc in dc, (3 dc in ch-3 sp, dc in sc, 3 dc in ch-3 sp, dc in dc) twice, 3 dc in ch-3 sp, ** 5 dc in sc, (3 dc in ch-3 sp, dc in dc, 3 dc in ch-3 sp, dc in sc) twice, 3 dc in ch-3 sp, dc in dc, dc in ch-3 sp, dc5tog (2 in ch-3 sp, 1 in sc, 2 in next ch-3 sp), dc in ch-3 sp, dc in dc, (3 dc in ch-3 sp, dc in sc, 3 dc in ch-3 sp, dc in dc) twice, 3 dc in ch-3 sp. Repeat from ** across to last 4 sc. 3 dc in next sc, dc in each of last 3 sc. Row 6: Ch 3, turn. Dc in second sc, dc in each of next 2 dc, ** ch 3, skip 1 dc, (sc in next dc, ch 3, skip 3 dc, dc in next dc, ch 3, skip 3 dc) twice, sc in next dc, ch 3, skip 5 dc, dc in dc5tog, ch 3, skip 5 dc, (sc in next dc, ch 3, skip 3 dc, dc in next dc, ch 3, skip 3 dc) twice, sc in next dc, ch 3, skip 1 dc, dc in next dc. Repeat from ** across to last 2 dc and turning ch. Dc in each of next two dc. Dc in top of turning ch. Row 7: Ch 1, turn. Sc in first dc, sc in each of next 3 dc, ** skip ch-3, 7 dc in next sc, skip ch-3, sc in next dc. Repeat from ** across to last 2 dc and turning ch. Sc in each of next two dc. Sc in top of turning ch. Row 8: Ch 3, turn. Dc in second sc, dc in each of next 2 dc, ** ch 3, skip 3 dc, sc in next dc, ch 3, skip 3 dc, dc in next sc. Repeat from ** across to last 3 sc. Dc in each of next 3 sc. Row 9: Ch 3, turn. Dc in second dc, dc in next dc, 3 dc in next dc, (3 dc in ch-3 sp, dc in sc, 3 dc in ch-3 sp, dc in dc) twice, 3 dc in ch-3 sp, dc in dc, dc in ch-3 sp, dc5tog (uses 2 in ch-3 sp, 1 in dc, 2 in next ch-3 sp), dc in ch-3 sp, dc in sc, (3 dc in ch-3 sp, dc in dc, 3 dc in ch-3 sp, dc in sc) twice, 3 dc in ch-3 sp, ** 5 dc in dc, (3 dc in ch-3 sp, dc in sc, 3 dc in ch-3 sp, dc in dc) twice, 3 dc in ch-3 sp, dc in dc, dc in ch-3 sp, dc5tog (uses 2 in ch-3 sp, 1 in dc, 2 in next ch-3 sp), dc in ch-3 sp, dc in sc, (3 dc in ch-3 sp, dc in dc, 3 dc in ch-3 sp, dc in sc) twice, 3 dc in ch-3 sp. Repeat from ** across to last 3 dc and turning chain. 3 dc in next dc, dc in each of last 2 dc, dc in top of turning ch. Repeat rows 2 through 9 until afghan is desired length. End with either a row 5 or 9. Finish off and weave in end. Very pretty and kind of you to share. 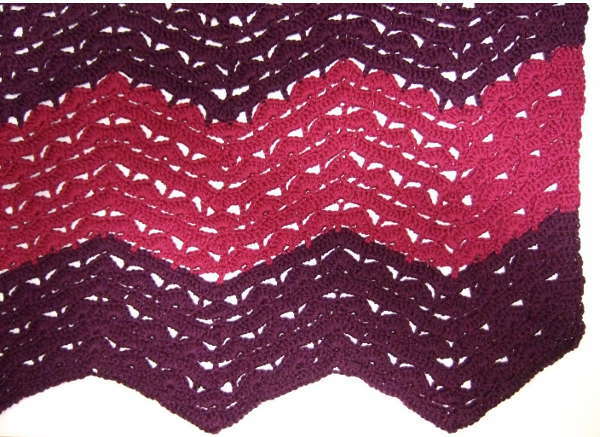 I have been looking for pretty ripple design to crochet for my granddaughter. This will be perfect. Thank you. I just found your site and I love your patterns and all the detail and hard work that you put into publishing these patterns. Thank you very much. I’d love to make this afghan! It looks verry interesting and easy to do, I’ll try it as soon as I finish the prijectr in progres, can’t wait. Thanks for a good picture of it, it helps a lot! **5 dc in next ch st?This is the 1st row. dc5tog from the 1st row.I really want to make this afghan but seem to be having a problem getting it to work out right.I made 9 rows and since it didn’t look right I took it out and now I am trying it again but still having a problem.Can you help me with what I am doing wrong.I watched the tutorial and can’t seem to do it right. Good catch on the first row. I have corrected that in the pattern. Thanks for letting me know. Coming back from the end of row 1, there are 27 dc which are made up of the last 3, the 3 in one ch and the 21. For row 2, you have 4 sc, skip 1 dc and dc in a dc for the first six of those. For the next 16 of them you work the part in parantheses twice. Then you skip 5. The next stitch should be the dc5tog which gets a sc. Row 2 works up to the first 5dctog but after that goes askew. Could you please clarify the accurate pattern? It’s so pretty I’d love to work it. If you read charts, the chart might be helpful. Also, if you could describe more what is happening at this point or even send me a picture, I’ll try my best to help. Is there a tutorial for this Afghan? I haven’t made a tutorial for this one but I added it to my list of requested tutorials. I have trouble understanding project’s instructions. Is there any tutorial for this particular afghan? I love it and would like to make it. I haven’t done a tutorial on this one yet. Is there anything in particular about it I may can help you with? Hello! This pattern is just beautiful. Could you please provide a chart? It would be very useful. Thanks in advance! Sorry about that. They were there but had just gotten stuck to the end of Row 3. Somehow my paragraph spacing got lost. I’ve fixed it now. Thank you for sharing! I love finding new ways to make blankets!!!! This is a beautiful pattern! Thanks for sharing – I am going to attempt this. Thank you sooo much Mama. Soon as I seen this pattern I knew I had found EXACTLY what I needed. My friend has just opened her new Hair Dressing Salon and her colours are Silver-Grey snd Dusky Pink. She inherited 2 black leather lounges with the salon and 2 of the small or mayhap medium of these to throw over the back of the sofas will be just perfect. Again, thank you so very much for unselfishly sharing such a simplistically beautiful throw pattern. I was just asked to make a pink and purple girly afghan for my neighbor’s daughter. This looks perfect! Thanks so much! I love your pattern, thank you for sharing. Thank you for giving the beginning chain length and measurements for alternate sizes of this project. It is much appreciated, now I can make this for both my kids.